Does anyone else feel like their scraps are coming to get them! I do! I try to cut so geometrically that I am left with minimal scraps! I literally figure out my block pattern by seeing how much of each fabric I have. That degree I’ve almost finished in Financial Mathematics, and my love of Geometry make planning out a quilt quite easy! I try my best not to have scraps and I still have quite a few! I take my scraps from each quilt and put then in a ziplock bag and put the name of the quilt on each bag and the month and year I made it. This way, if I need a scrap for something, I can find it quite easily by remembering what quilt it was in and then just find the bag! I also love doing a nice scrap quilt to help dwindle my scrap collection! In fact, my favorite scrap quilt is the one I made for Marriage equality! Especially now that gay marriage is allowed in Minnesota! A lot of the scraps were too small to use, so I had to combine like colors and patterns to give the illusion of a single color! In fact about half of the scraps I used were from someone else. 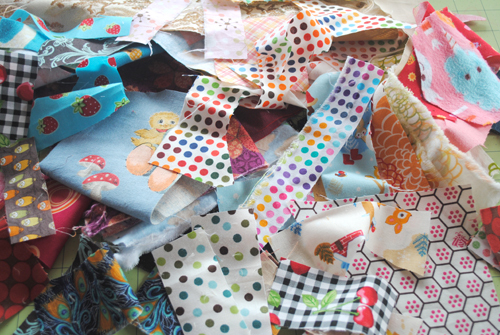 People are very surprised when I show them how little scraps I have after each quilt! I like to call it economy quilting! Less scraps, less money spent on fabric, and more money to buy more fabric! Hahaha! When I mentions scraps one of my quilting friends says says how oppressive her scraps are! She feels weighed down by them, and doesn’t want to waste them, but doesn’t really have a project in mind to use them! I never really have that problem, as I never have enough scraps to feel bad about! Haha! although, It seems my scrap collection is starting to get a few larger pieces in it, now that I am doing more quilts for sale. I really don’t have the freedom I have when making a quilt for myself when someone else is in creative control, and have started to garner a few extra scraps. So I am starting to understand the oppression of scraps! Haha! Hopefully I’ll find a project to use them soon! Fingers crossed! ← Finished the Quilting and Binding! I think about this quilt a lot. I just love it. Thanks for sharing the pics!